Remember that game Guess Who? You had to narrow down a field of people to find the one your opponent had chosen. Is this person wearing glasses? Do they have brown hair? Are they wearing a hat? Well, as a B2B marketer, I bet you sometimes feel like you’re playing a game of Guess Who when figuring out those key people you want your content to reach. Is this person the decision maker? What types of content do they prefer? What are their biggest pain points? Thankfully, you’ve got a crucial tool on your side to help you hone in on those potential customers: persona development. 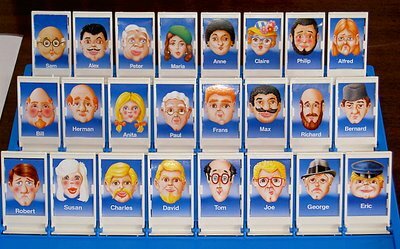 Persona development takes the guessing out of Guess Who and allows you to create detailed profiles of your ideal prospects, their personalities, their preferences and their problems (I guess you can say it lets you describe your prospects to a P … ba dum tss). But creating effective B2B personas is not as simple as asking what attire or hair color each person has. It requires a dedicated effort to look deep into data, discover the biggest pain points, and find out how your brand can help. Before you learn how to develop B2B personas, you need to look at why you need them. “With the amount of noise your average user faces on and offline, it’s important to make sure your brand’s messaging speaks to each unique user, and you have to reach those users in the specific moment with what will resonate the most with them,” said Brafton Director of Consulting Andy Walters. The personas you create serve as blueprints for how you will write, develop and distribute your content. They allow you to take your overall target audience and narrow it down even further so that you are finding the right resources, topics and channels for each ideal prospect. Without these blueprints, you’re not going to be able to build a successful marketing strategy. Another reason that persona development is vital for your brand is the B2B sales cycle. Unlike your B2C counterparts, the journey from awareness to decision may involve multiple steps and people, meaning it takes longer to turn a prospect into a customer. Your B2B personas give you the insight and information you need to appeal to each person at each step of their journey and give them relevant content for every stage. 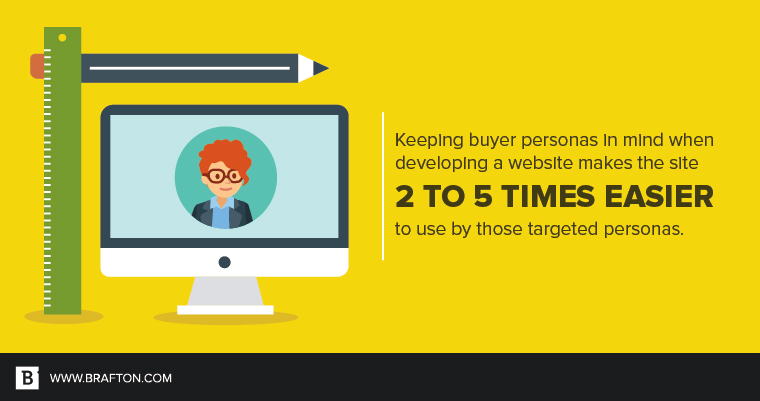 Keeping buyer personas in mind when developing a website makes the site 2 to 5 times easier to use by those targeted personas. 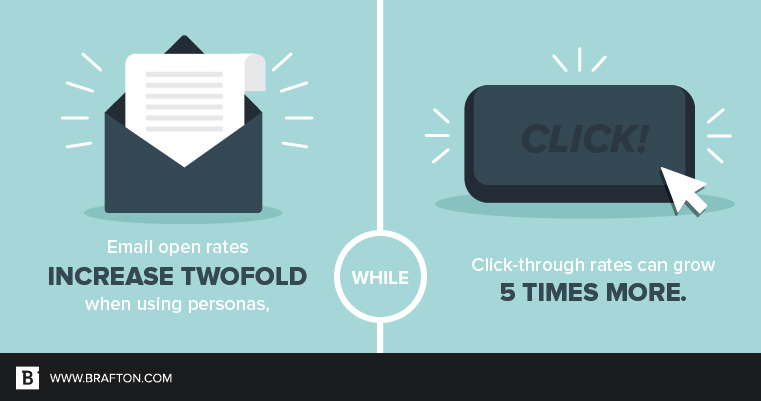 Email open rates increase two-fold when using personas, while click through rates can grow 5 times more. 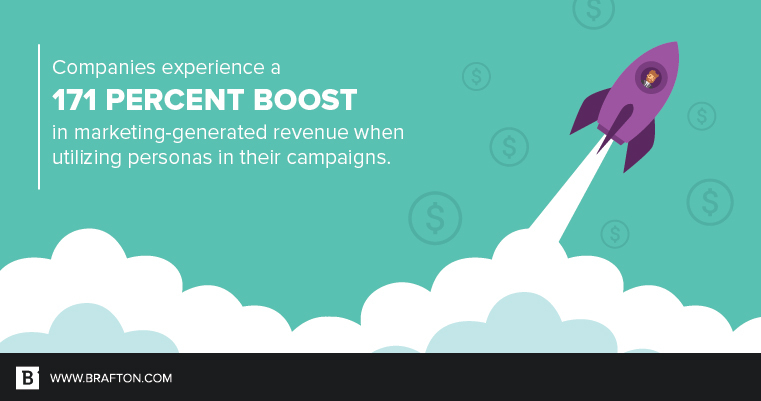 Companies experience a 171 percent boost in marketing-generated revenue when utilizing personas in their campaigns. Knowing all of this information is certainly valuable, but it won’t do you any good unless you’re putting it to the test to create effective personas that successfully reach your ideal prospects at the right time. 1. Start by going internal: If you want a clear picture of each persona, start by meeting with your team members. Why? Well, your CEO is going to have a different perspective than the middle managers or newer staff members. Ask about current clients, new trends and other industry aspects that can influence your personas. You want to get each and every viewpoint so that you can create a consistent message from beginning to end. Additionally, talk to the sales department. Having their insight paints a better picture of the cycle they go through with prospects, and this can significantly inform your persona development strategy. What influence does the persona have over the final decision maker? What pain points can be addressed for an effective campaign with this person? What marketing messages will resonate most with them? Where does this person find industry news and trustworthy information? 3. Look at the data: Although you are defining the personalities and preferences of your ideal prospects, you need to take a look at the hard numbers, or data. Research which channels they are using, which devices they are accessing the web on, where they are located, and what times of day, week and month they are consuming your content, among other data points. Also look at how they are getting to your site, whether through organic search, referral traffic or other sources. Check the numbers of new visitors to repeat ones – you don’t want to create personas centered solely on new users, as your repeat visitors are just as important. 4. Interview existing customers: To gather information that Google Analytics can’t give you, try talking with your current customers. They’re going to let you know what did and didn’t work in terms of marketing, and what they like about your product and service. They’ll also be able to give you insight into their purchasing decision and the various influencers involved in that process. All of this data is extremely valuable when creating your B2B personas. 5. Don’t forget the personal details: You may work in the B2B sphere in which things are more professional and formal, but that doesn’t mean you can forget the personal side of things. After all, you’re still marketing to people, not just businesses. When developing personas, add in details like hobbies, family, interests and other factors. “Understanding more about your personas, what affects them outside of the workplace – what they do for fun, how they spend their free time, where does their discretionary income go – can provide a more in-depth understanding of why they make certain choices,” Andy explained. 6. Revisit and revise: Change will always happen, and you need to be prepared for it. The personas you create today may not be the personas you need a year from now, so always be ready to revisit and revise your profiles. Look at your personas every year at the very least to assess any changes that have happened. Every industry is going to continue evolving, and your marketing should evolve with it. 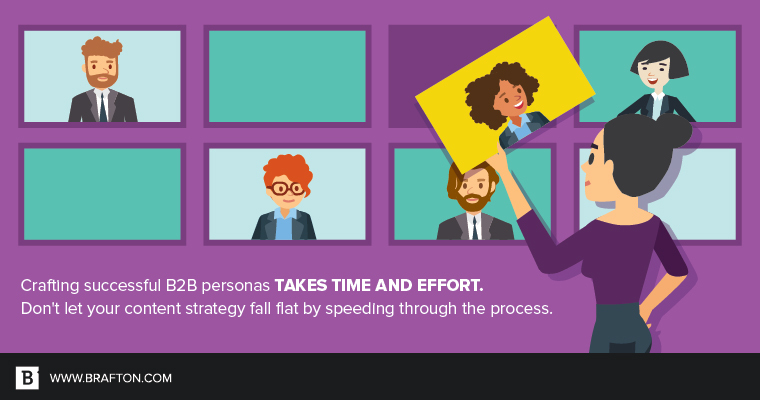 A B2B persona strategy that is ready to be revised is one that will succeed. Your ideal prospects are out there, waiting to do business with your brand. Make sure you are targeting them in the right way and at the right time by creating effective B2B persona profiles.